Theodore Roosevelt was the 26th President of the United States who served in office from September 14, 1901 to March 4, 1909. What was the life of Theodore Roosevelt like? The short biography of President Theodore Roosevelt covers important information and facts about his early life, his family, career and the famous events and achievements of his political life. Our short biography of Theodore Roosevelt provides an interesting and easy way to learn about the life of the President. The following important facts provide a fast overview of important facts about President Theodore Roosevelt. Facts and Info: Theodore Roosevelt was the 26th president of America and the first President to visit a foreign country whilst in office. He is famous for many accomplishments including the building of the Panama Canal, creating the National Parks and cracking down on business monopolies. For additional info refer to 20 Facts about Theodore Roosevelt. Facts and Info: He was born on was born on October 27, 1858 in New York. He grew up in New York City, the second of four children. His father, Theodore Senior, was a well-to-do businessman and philanthropist. Theodore Roosevelt was a third cousin twice removed to Martin Van Buren. He died on January 6, 1919 in Oyster Bay, New York. Facts and Info: The career of Theodore Roosevelt included the roles of Author, Lawyer, Politician and Statesman. He had an excellent education at Harvard College where he graduated in 1880. He did not find studying difficult as he had a photographic memory. He became the 26th President of America in 1901 and served for 8 years until 1909. Facts and Info: Theodore Roosevelt married Alice Hathaway Lee on October 27, 1880 and had a daughter called Alice Lee. He was married for the second time on December 2, 1886, to Edith Kermit Carow. They had 5 children whose names were Alice Lee, Theodore, Kermit, Ethel Carow, Archibald Bulloch and Quentin. He was affectionately called by several nicknames including "Teddy"; "Trust Buster" and "TR". Facts and Info: Theodore Roosevelt belonged to the Republican Political Party. He was 42 years old when he was inaugurated as the 26th president. He wore a ring containing a lock of Abraham Lincoln's hair to his inauguration. Charles W Fairbanks stood as the Vice President. Teddy Roosevelt was the first President to use the media to appeal directly to the people. For additional facts refer to his Presidential Cabinet members. Short Biography of Theodore Roosevelt: What he was like! Facts and Info: Theodore Roosevelt had an imposing, well built figure although he was only 5 feet 8.5 inches. A 60-foot (18 meter) sculpture of his head is now carved into Mount Rushmore. A terrible tragedy struck Teddy when both his mother and his first wife died in the same house on the same day. The teddy bear is named after Theodore Roosevelt. Facts and Info: During his lifetime he played a key role in important events of the era. Theodore Roosevelt was instrumental in the acquisition of the Panama Canal Rights in 1904, the Pure Food and Drug Act and the "Square Deal" domestic program. He was in office when the San Francisco Earthquake struck in 1906 and he added the Roosevelt Corollary to the Monroe Doctrine. He work was recognised when he won the Nobel Peace Prize. 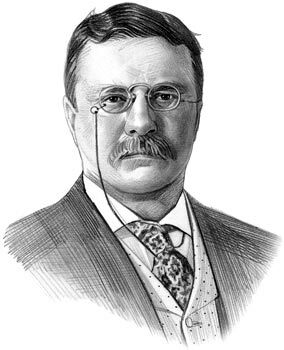 Facts and Info: During his life Theodore Roosevelt was injured by a gunshot wound and suffered from nearsightedness (myopia), asthma, a detached retina, blindness in one eye, deafness in one ear and rheumatoid arthritis. He died in his sleep from a coronary embolism on January 6, 1919 in Oyster Bay, New York. Theodore Roosevelt was buried in Young’s Memorial Cemetery, New York. Historians typically rank Roosevelt among the top five presidents. The short biography of Theodore Roosevelt provides a fast overview of the key facts and events about his life and the accomplishments of his presidential term in office. The following Theodore Roosevelt video enables you to sit back and listen to the history of his personal and political life - a useful educational resource for kids, children and schools learning about the life of President Theodore Roosevelt.